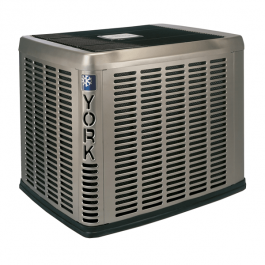 The York YZF Series Heat Pump unit is the outdoor part of a versatile climate system. It is designed with a matching indoor coil component from Johnson Controls Unitary Products. Available for typical applications, this climate system is supported with accessories and documents to serve specific functions. Protected Compressors - Each compressor is protected against high and low pressure as well as excessive temperature. This is accomplished by by the simultaneous operation of a high pressure relief valve and temperature sensors which protect the compressor if undesirable conditions occur. Environmentally Friendly Refrigerant - Next generation refrigerant R-410A delivers environmentally friendly performance, with zero ozone depletion. Durable Finish - Automotive quality finish provides the ultimate protection from harmful U.V. rays as well as rust creep, ensuring long-lasting, high quality appearance. A powder-paint topcoat is applied over a baked-on primer, using a galvanized, zinc coated steel base material. The result is a finish that has been proven in testing to provide 33 greater durability than conventional powder-coat finishes. Lower Installed Cost - Designed to provide enhanced installability by featuring a slide-down control compartment, allowing easy access to control components along with angled service valves to reduce overall installation time and cost. Filter-Drier - A factory installed, solid core liquid line filter-drier filters harmful debris and moisture from the system. Composite Base - Strong and durable composite base pan provides added strength while resisting rust and corrosion, as well as reducing sound and vibration. QuietDrive System - The swept-wing fan, composite base pan, isolated compressor compartment, and single-stage compressor are engineered as a system to reduce overall sound to a mere whisper. The 5-ton system utilizes a two-stage compressor. Complete System Control - All models utilize the exclusive microprocessor based, on-demand, defrost control system. This system provides optimal comfort, efficiency, and constant montoring of the entire system for reliable operation. Defrost cycles occur only when necessary. An adjustable balance point insures supplemental heat is brought on only when required to meet the space load, for optimum efficiency and reliability. Communications Capable - Requiring only a simple 4-wire installation, the communicating capability enables the use of the Touch Screen Communicating Control, allowing real time visibility of system operation and the use of diagnostic features, while still maintaining the ability to function with a traditional thermostat.